Per Reuters, the White House says it will reopen negotiations on immigration reform 'when the Democrats start paying our armed forces and first responders'. 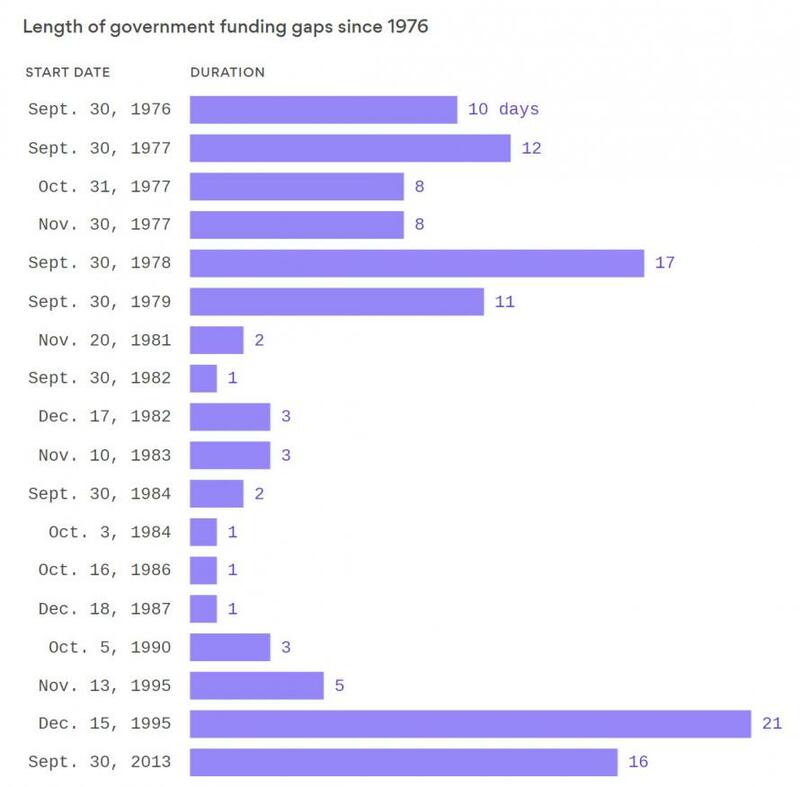 Despite last minute 'compromise' meetings, and continued "hopes" from various sides, The Senate failed to reach the 60 votes necessary to keep the government funded (even for a stopgap) and so, as of midnight tonight, the government will shut down. CNN's Phil Mattingly explained on air: "Democrats aren't looking for a reduction in time in the continuing resolution, they're looking for substantive policy, commitments, changes or actual legislative text before they are willing to come on board with that." "Our country was founded by geniuses, but it's being run by idiots," Kennedy told reporters hours before the government was set to enter a shutdown. Should Congress not pass a Fiscal Year 2018 ("FY2018") appropriation or continuing resolution ("CR") by January 19, 2018, the Executive Office of the President ("EOP") would be without authority to incur any financial obligations in FY2018, with very limited exceptions, and would therefore implement a contingency plan for shutdown furlough (the "Contingency Plan"). 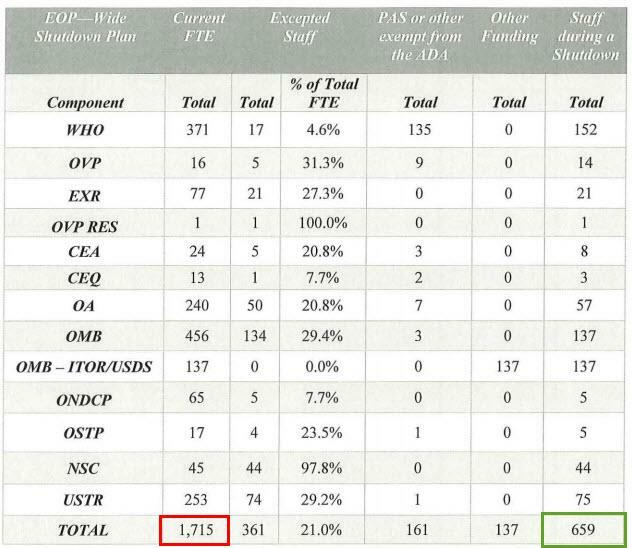 The Contingency Plan entails placing an estimated I 056 ofthe 1715 EOP staff in furlough status ("Non-Excepted Staff'), while an estimated 659 EOP staff would continue to report to duty because they are (i) designated as excepted to perform emergency or excepted functions; (ii) Presidentially Appointed, Senate Confirmed staff; (iii) otherwise exempt from the Anti-deficiency Act; (iv) alternatively funded during a government shutdown (collectively, the "Excepted Staff'). 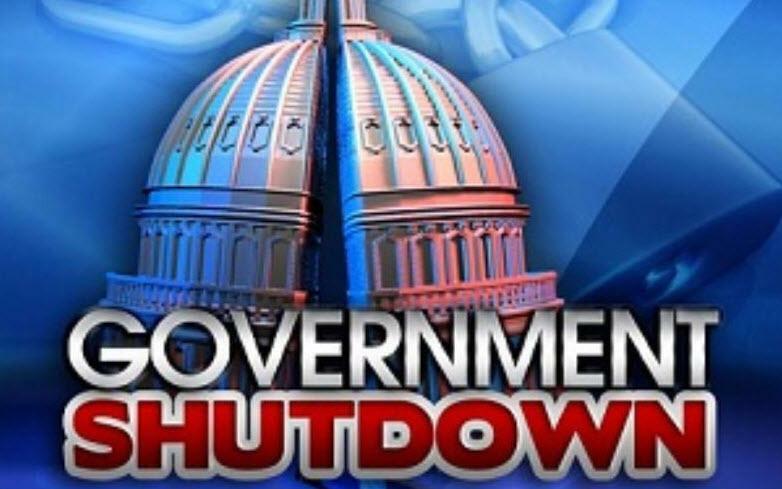 Any EOP personnel that are other government employees ("OGEs" or "Detailees") would be furloughed or continue to report to duty at the discretion of their respective home agencies. Once it becomes clear that neither an appropriations bill nor a CR will be enacted prior to January 19, 2018, the White House Office of Management & Administration ("M&A") will notify EOP components to begin an orderly shutdown of unfunded functions. Non-Excepted Staff will receive shutdown and furlough notices. Detailees will be notified by their home agencies whether they are to be furloughed. The question is - will government ever re-open? As Trump tweeted earlier, the Democrats want to shutdown to dim the success of the tax cuts; and as Goldman noted earlier, for every week of government shutdown, GDP growth will drop 0.2ppt. The battle of the hashtags has begun - #RepublicanShutdown, #TrumpShutdown, or #SchumerShutdown. All of which distract from the only hashtag that really matters currently - #ReleaseTheMemo. Update (6:20 pm ET): Democratic Sen. Heidi Heitkamp says she will vote for a 5-day stopgap plan being hashed out by a group of senate Republicans. While Mulvaney has expressed optimism that a deal will be reached within the next 24 hours, Mark Meadows, leader of the House Freedom Caucus of conservative Republicans, said the 5-day agreement is a nonstarter - Which an administration insider confirmed. Heitkamp represents North Dakota - a state where Trump won more than 60% of the vote in 2016 - and will be running for re-election in November. Her seat is viewed as vulnerable by some Republicans. According to the Washington Post, Heitkamp also supported the Republican plan for a one-month extension, as did Indiana's Joe Donnelly and West Virginia Sen. Joe Manchin III. All three senators face a difficult path to reelection in heavily Republican states. Update (5:40 pm ET): OBM Director Mick Mulvaney says he "thinks there'll be a deal in the next 24 hours." Meanwhile, a White House aide said a proposed 5-day bill is a non-starter - echoing sentiments expressed by Freedom Caucus head Mark Meadows. Update (5:20 pm ET): Trump tweeted that he had an "excellent" meeting with Schumer, and that he's working with both Democratic leaders, as well as Paul Ryan and Mitch McConnell to hammer out a four-week extension. He confirmed to reporters that "some progress" has been made, but that a deal has not yet been reached and "disagreements on several issues remain." Nancy Pelosi says she believes a deal is "within reach." Pelosi: :I think an agreement is in reach. I think they just have to decide"
Pelosi on Trump meeting with Schumer: "That’s good..Mr Schumer is aware or our priorities"
Update: There is still no vote scheduled for the Senate, but that didn't stop John Cornyn, the Republican No. 2 in the upper chamber, from telling reporters that he expects a vote to be held "after lunch." Fox News is reporting that Schumer has arrived at the White House. 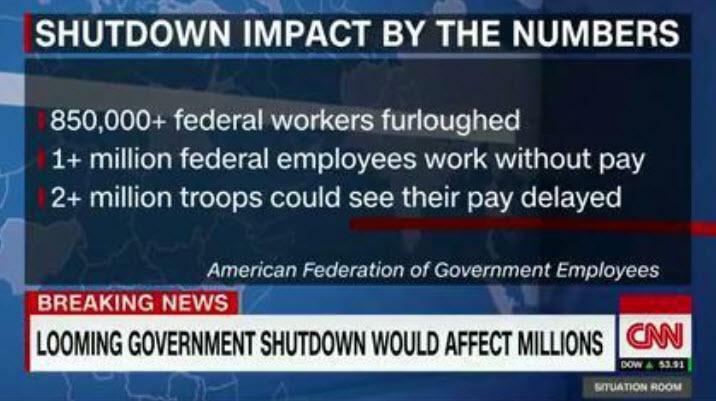 They even have a name for it: "The Schumer Shutdown". “This is an attempt by democrats led by Schumer - that’s why we’re calling it the Schumer shutdown - to embarrass the president,” Mulvaney said. “They don’t oppose anything in there. They support chip they don’t want the cadillac tax to go into place they’ve always supported clean CRs. And again, it worked in the House - there were several Democrats who voted for it,” Mulvaney. DACA doesn’t expire until March 5 - and therefore, doesn’t need to be dealt with until mid-February, Mulvaney said. As of now, it looks like the federal government expects the shutdown to happen - though Mulvaney said their version of the shutdown would be more "moderate" than the previous shutdown, which happened during the Obama years. Mulvaney accused the Obama administration of "weaponizing" the shutdown by ensuring that virtually all federal employees didn't show up for work. While Mulvaney and Short were answering questions from the media, President Trump chimed in on twitter, chiding Democrats for opposing the bill. Trump blasted California Sen. Dianne Feinstein, tweeting a quote from her in the Washington Examiner: "Shutting down the government is a very serious thing...People die, accidents happen. I don't know how I would vote right now on a CR, OK?" With the one-month stopgap spending bill stalled in the Senate, the White House is finally accepting the fact that there's little it can do to prevent the government from shutting down at midnight on Friday. Trump has promised to remain in Washington - postponing a weekend trip to Mar-a-Lago - until the shutdown is averted or ended, and in order to keep the media apprised of what's about the happen, the White House is holding a press conference at 10:30 am ET. The press conference will feature White House Legislative Director Marc Short and OMB Director Mick Mulvaney, who only minutes ago warned that the odds of a shutdown were "50-50" - another way of saying "we have no idea what's going to happen."